Last Friday we spent the day working with 4th grade at Chamberlayne Elementary. The teachers wanted us to focus on vocabulary, specifically affixes (prefixes, root words and suffixes). We find that affixes is a weak skill across the board in grades 3-5 so we were excited to come up with some “techie” activities that would make this challenging skill fun and exciting. To kick off our hour session, we launched a NotebookCast board.This new tool is still in Beta and is a FREE online collaborative board. NotebookCast has the teacher create a free account. 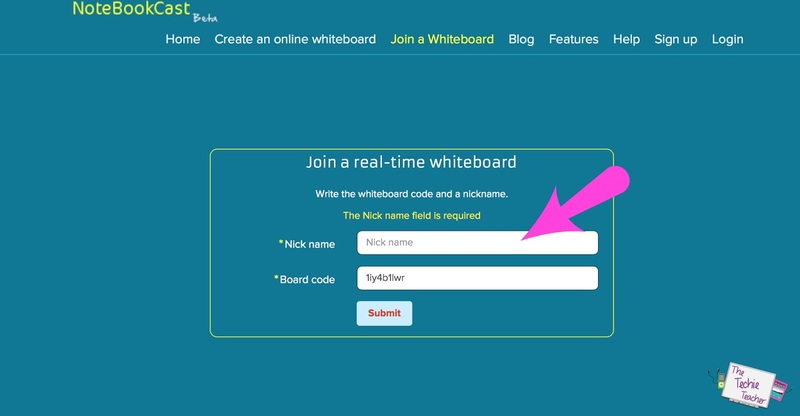 You create a virtual board that you share out with students via a link. 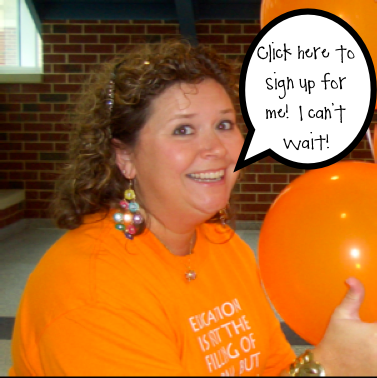 Students click the link, enter a “nickname” and click submit. I LOVE how the tool automatically inputs the board code so the students don’t have to type it in. We had created THESE images in PowerPoint and saved them as jpegs to import into our board. Students saw the changes instantly/in real-time as we deleted and added new images to discuss. They used the chat feature to talk about possible definitions of the words I posted to the board. Next, we broke the words down together as we called on students individually to “stoplight” our words. We circled the prefix in green (this starts our word), underlined the root words in yellow and boxed our suffixes in red (this ends our word). The PRS letters serve as a visual to remind students the ORDER of the parts of the words which happen to be in alphabetical order: Prefix, Root Word, Suffix. Would we use Notebook Cast again? Well, that’s great question. We ran into the issue of the site only accepting a certain amount of users. Oh well, you live and learn. We ended up partnering the kids and it worked fine. Would have we have liked all of the kids to have been on interacting? Of course. However, like all classroom teachers, we had to adapt. Notebook Cast might be a better tool to use with smaller groups. After our warm up, we broke the students up into small groups to work on a mini digital project with the ITRTs. The led from the pencil is a conductor which made the MaKey-MaKey work! Mrs. Green and Mrs. Robinson’s groups jumped on Nearpod and interacted together dissecting prefix, suffix and root words. Nearpod is an interactive tool that engages students, assesses their understanding and inspires success! When the teacher launches Nearpod as a live presentation the students are then given a code to “join” that Nearpod presentation. Today students reviewed five prefixes and five suffixes. They created their own words using the drawing tool within Nearpod, they watched short review clips online and even played two interactive games embedded into their lesson. Finally before finishing students were given words with both prefixes and suffixes and asked to circle the prefix, underline the root word and box in the suffix. The student’s favorite part was how Mrs. Green and Mrs. Robinson were able to control their computers! Mr. Covais’ groups took to Dell Webcam Central and Movie Maker to make some videos about prefixes and root words. Students chose a word and identified the prefix and root word. After the identification they worked with partners to discuss how they would act out the prefix and the root word. The students recorded their acting in Dell Webcam Central in two short clips. The partners then took the clips and put them into Movie Maker in the form of an addition problem. Best part of all, the teacher can now use these short videos for review in class. Students had so much fun making these videos. 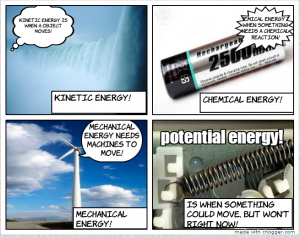 Check out a this awesome student example! Click the link below to get everything you need to get started! Mrs. Hues and Mr. Caratachea had a blast making raps with their groups! Different students approached the activity in a couple of different ways. Some students wrote a rap about prefixes and suffixes, while others just wrote a rap. No matter what the students chose to write their rap about they typed up their lyrics in Microsoft Word and highlighted all of the words using prefixes or suffixes. Once the students had their raps ready to go they went to an online drum machine to make their beats. We chose this particular drum machine because it is super easy to use. Students don’t need to have any prior knowledge on music production to quickly get the hang of using this tool. After the beats were made the students needed to record their track. We used Audacity to record the beat and then recorded their vocals on another track. Audacity is a great tool for simple multi or single track recording. The kids had some pretty serious rhymes going on! Check it out! 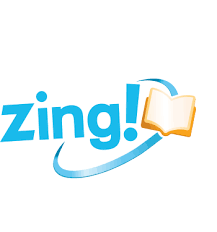 Ms. Ashworth’s kindergartners learned about Zing today. Ms. Ashworth had her class set up and ready to go! We helped the kindergartners login and find their avatar. The kindergartners then found a book and had fun reading along. What fun! Mrs. Woolheater’s second graders did an animal Nearpod. Students had fun recalling facts about animals and their habitats. They also had fun doing different activities within the Nearpod. Mr. Fairlamb’s fourth graders continued working on their ActiveInspire flipcharts about Virginia. Each student is making their own flipchart to share with the class about Virginia Studies and what he/she has learned this year. Students are becoming pros at ActivInspire. They are inserting pictures, changing layers of the objects, drawing/annotating on shapes and pictures. They are even teaching on another! Today Mrs. Uzel’s fourth grade class tried the site chogger.com. 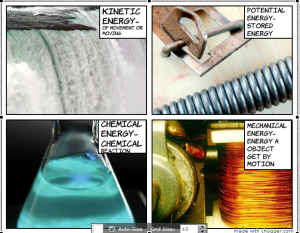 Students worked with the four types of energy. 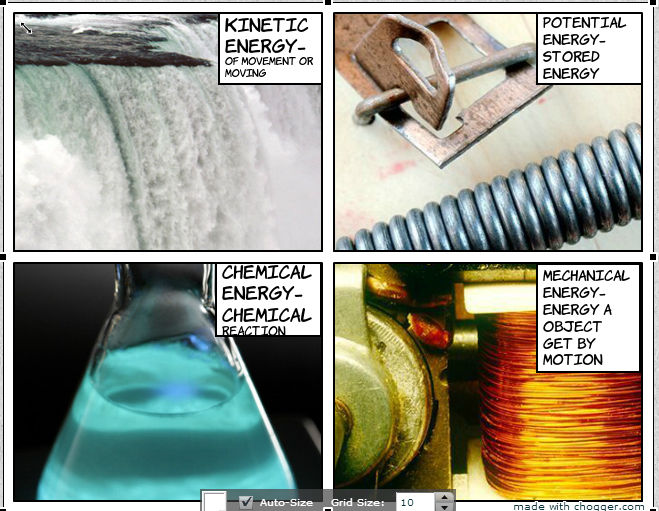 They found pictures of each type of energy in Britanica Image Quest and then added them to Chogger. They then wrote captions about each type of energy and its uses. Second graders did a Nearpod on habitats. We reviewed important information on habitats of animals that often stump the students. Students had the opportunity to draw, write, and answer a,b,c,d questions. Mrs. Alexander’s class began working on their Virginia Studies Promethean slide show for the year. Students will have all the information they need about Virginia studies by the end of the year. This is a huge project in fourth grade! Mrs. Uzel’s 4th grade class had fun with Nearpod today. Students worked on reading comprehension in a different way. Students loved reading passages on Nearpod then doing short activities in Nearpod. They didn’t even look at it as if it were like doing a reading test! 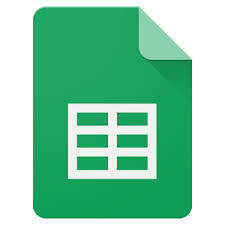 Fourth graders created graphs in google sheets to show their testing progress throughout the year. Students graphed their benchmark tests for reading, math, science, and social studies in order to show gains throughout the upcoming year. Last Friday #TechTakeout had the pleasure of going out to Ratcliffe Elementary. We had a blast doing computation with fractions! We first started off doing a Kahoot to get everyone warmed up. It was 5 easy fraction questions, just enough to get everyone excited. Here’s the link to the Kahoot if you want to use it in your classroom. The students then split into four groups and each did a different activity involving fractions. While the students were working we had the 3D printer going! The students loved watching the printer work. Since our focus was fractions for the lesson we printed two fraction pies for each class. We downloaded the templates here, changed the colors of the pies, and then printed while in the class. Our Elementary Instructional Technology department wrote a grant last year to the Henrico Educational Foundation for the 3D printer. We have been using it in classrooms across the county in multiple curriculum areas with huge success. Then they took a screen shot of their work using the snipping tool and uploaded it onto http://www.abcya.com/talkify.htm to make their work talk. They added their mouths and recorded their voices. Here is an example. fraction talk from Sarah Green on Vimeo. Mr. Covais and Ms. Browne had students copy a Google Slides template to add fractions with unlike denominators. They worked in partners to find a common denominator and dragged stars to represent their problems. After that, they saved their pictures to their desktop and uploaded it to the website, Educreations. They recorded their voices explaining how they solved their problems. Mr. Caratachea and Mrs. Robinson’s group worked on simplifying fractions. The students all signed in as a guest to a newer resource called BoardThing. This resource is somewhat similar to Padlet but has some different features. Prior to starting the lesson Mrs. Robinson and Mr. C uploaded 5 images and placed them across the top. When the students joined the board they each picked a different colored post-it note to use for their fractions. Then they placed their names on the post it placed it under the flag they were racing to. Then we were ready to start our game. We found an awesome set of fraction task cards that we printed, laminated and took into the classrooms. Each kid started with one task card. Their job was to reduce the fraction to the simplest form and then create a post-it note on our BoardThing. Then they placed their post-it in their column and worked their way to the finish flag. We had an awesome time racing to the top! Check out one of our BoardThing walls! Mrs. Hues and Ms. Wright did Nearpod on fractions. Students had to fill in the blank, find common denominators, watch a video, and take a short quiz. Students watched a short quiz in Educreations on how to find the common denominator without multiplying the two fractions together.Students then practiced what they learned on Nearpod. At the very end students had a mini quiz for review. We had a blast coming out to Ratcliffe! We can’t wait to bring #TechTakeout to the next school! Second grade did their first Nearpod lesson on Native Americans. They loved using the computer to review the tribes! They thought Nearpod was a fun alternative for review. Today the #TechTakeout crew headed over to Montrose Elementary to work on language arts! Mrs. Hues, the ITRT at Montrose, met with the Title I Reading Teacher, Kathy Rohr, to find the grade level and topic with the greatest need. The winners of the #TechTakeout party were 3rd grade! We came in to focus on different activities that the students could do during stations. So many teachers are looking for ways to spice up their word study stations, and that’s where the #TechTakeout crew comes in! We shared four different station ideas and tools that the students will be able to use independently after today. We opened the day with an awesome Nearpod activity that Mrs. Hues created. Montrose, was just awarded a HEF grant for Nearpod licenses and iPads, so we were eager to learn more about the full possibilities of Nearpod. Mrs. Hues and Mrs. Green had the students work on word sorts using Promethean flipcharts on their own computers and on the Promethean board. They used the word sorts that they downloaded from this site. When they were done sorting the words, they used the sound recorder to record themselves saying the words and why they are in each sort. The students did a great job with this activity and were rewarded with a fun game! Scrabble Slam is a popular card game, but the students today played it on the Promethean board. They challenged each other to make words using the tiles, but they had to follow the word feature that they are studying. The students loved trying to make the most valuable word by adding up the value of each letter to determine the total value of the word. Ms. Browne and Ms. Wright used Tumblebooks and Padlet with their groups. They focused on CVC and CVCe word patterns. First, the students listened to a pre-selected story called Toopy and Binoo: Toopy’s Story by Dominique Jolin on Tumblebooks. Afterwards, they opened a Padlet wall and typed words they found in the story that fit the word patterns mentioned above. This activity challenged their brains since they had to find all of the words themselves within the text. Mr. Covais and Mr. Caratachea worked with Britannica Image Quest in tandem with Windows Movie Maker. First, the students used Clever to get to One Search. One Search is a great hub that we use in Henrico County for the students. Today we used it to get to Image Quest. The students chose some of their word study words and found images that represented those words. The students then saved the images to their desktop so they could easily be imported into Windows Movie Maker. Once the pictures were imported into Movie Maker, the students added a title. Each student added the pictures of their first word and then we added a title where the students typed their word study word. When the students shared out what they did they turned it into a game with their classmates trying to guess what their words were.